Home > Collector Items > Large Christmas Sleigh "Surprise"
One of our largest and Christmas Sleighs that we carry, built extra sturdy and great for both indoor and outdoor display use! 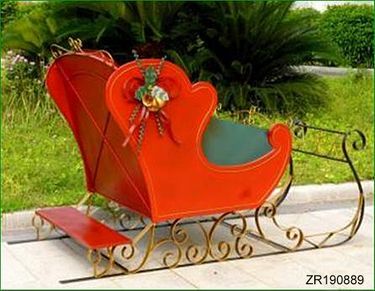 This Red & Gold Christmas Sleigh is quite a site in big full size and features beautiful runners and elegant scroll work with plenty of room for sitting and presents. Makes for a great photo opportunity during the winter for children to get their photo taken with Santa and his sleigh. An overall amazing piece that will brings with it extreme holiday cheer for any store, home and garden. Stands 83.25" Long x 39.5" Wide x 47.25" High. Approx: 150 lbs.